Let’s face it, commuting is an inescapable aspect of modern lives. Millions of people are commuting for hours every single day to get to school and work. The sad part is commuting can be quite stressful. Being stuck in traffic is no fun whether you’re on the bus, taxi or your own car. Getting on the subway during rush hour isn’t exactly an enjoyable experience too. With the ubiquity of mobile phones, it’s so easy to listen to your favorite music while commuting. We’re sure you’ve seen that everywhere, right? That’s how many people cope with commuting stress. They fill their playlist with their favorite songs to drown the crowd. 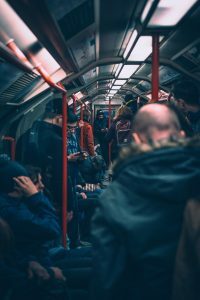 Is playing ambient music for commuting a better option? Of course, it can be a great alternative compared to listening to songs. After all, many people have enjoyed the calming effects of listening to ambient sounds. Some listen to it while studying, others while coding a computer program. So why not follow suit and start listening to ambient music during your commute? Starting your day with a fresh mind is always beneficial, right? For a start, you may want to try the relaxing atmosphere ambience. There are hundreds of them for you to choose from. But let’s not limit your choices too soon here. You can grab any ambience as long as it gets your nerve to cool down. Here’s an idea: Why not try to make your own version of commuting ambience? Experiment with different kinds of sounds instead of the usual calming ones like the rain or waves. Try to include sound that you hear on your commute. Things like car horns, various doors closing and opening, motorcycles, elevators, your breathing, and everything else. The big reason is that you are most likely had associated those sounds with stress. By mixing those very sounds in a calming context, you are re-associating them to something positive. You will also become more aware of your surroundings. The end goal for all this is to condition yourself, so even without playing the ambience, everything you hear during your commute will not stress you anymore. As many or as few as you wish. Remember, the only rule for making an ambient music for commuting is that it should make you feel relaxed. Any sounds that make you rush to get to your destination should not make it into the list. Of course, you can. Go ahead and visit ambient-mixer.com and you’ll find many city ambiences there. Better yet, use them as the foundation of your own version. Add the sounds that are unique to your commute; the sounds that connect you to your surroundings. That’s fine and we won’t judge you for it. We still hope that you’ll find some time to experiment with different kinds of ambience. Who knows, maybe you can start your own collection of ambient music for commuting. Be sure to publish and share them if you do, ok?